100% no spiders. Apart from that one, just climbing up your shoulder. I've wanted a display cabinet for my miniatures for years. In fact, it can be measured in decades. They look brilliant, and showcase the effort you've put in to your collection. At various points I didn't have the space, inclination to work it out, or the time to effect change. Finally I had all three, and here's the result. The cabinet itself is just an Ikea Billy bookcase, with Oxberg doors. I added glass shelves to maximimise the space that would benefit from the lights. Lighting is Ikea Ledberg strips, and this is the only moderately complicated part. 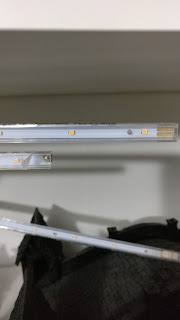 Ledberg comes in three connectable lighting strips and when the three strips are connected, they're a perfect fit for the internal width as the bookcase. But sadly you need add power in one end, and this makes it too long to fit. 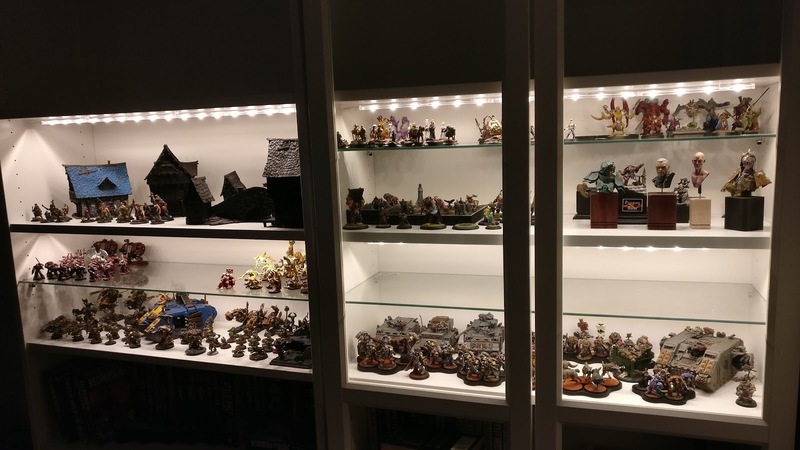 The easiest solution would be to use only two lighting strips, but then that would leave dark spaces to the sides and reduce the usefulness of the display area. Looking at the strips, I realised it should (note: should) be possible to trim part of a strip, make a small solder to rejoin the positive and negative connections and then ... it'll work? Right? It did! So I trimmed each third lighting strip about a third of the way down its length and added a dab of solder. Pleased with how that turned out. I measured under the shelves, and set the light strips back about three inches from the front, then screwed in the clips to hold the lights. 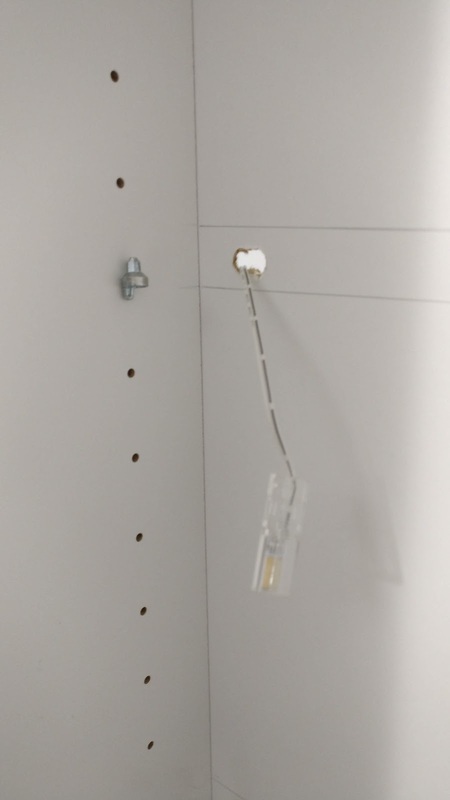 I used three clips, but in hindsight would probably have used four - with one near each end and two to support the joints between lighting strips. But I didn't, and here we are, but you can! It gives the cables sufficient space to pull through correctly, and remain hidden. When the shelf is seated, it pinches the cable a little and holds it in position tightly without damaging the cable. Be very, very sure of the shelf positioning before you do this. I spent a good hour or two doing "what if?" testing with miniatures of varying heights and sizes before settling on the final heights. The lower shelf is slightly taller than the upper shelf, but if you reversed that, it would look wrong. 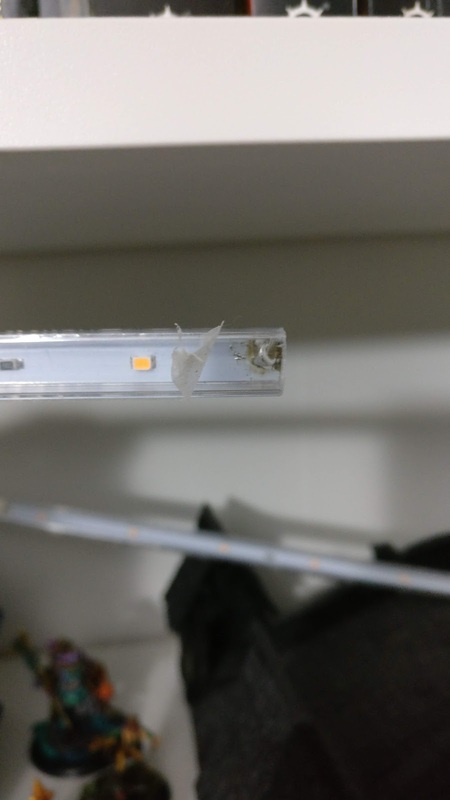 To fix the light switches in place, I applied the first part of a velcro strip to the side of the bookcase, applied the second part of velcro to the rear of each light switch. Ensure you place all the large bulky display pieces on the shelf under glass, not on the glass. It means light gets through to everything underneath, and doesn't create awkward shadow areas. 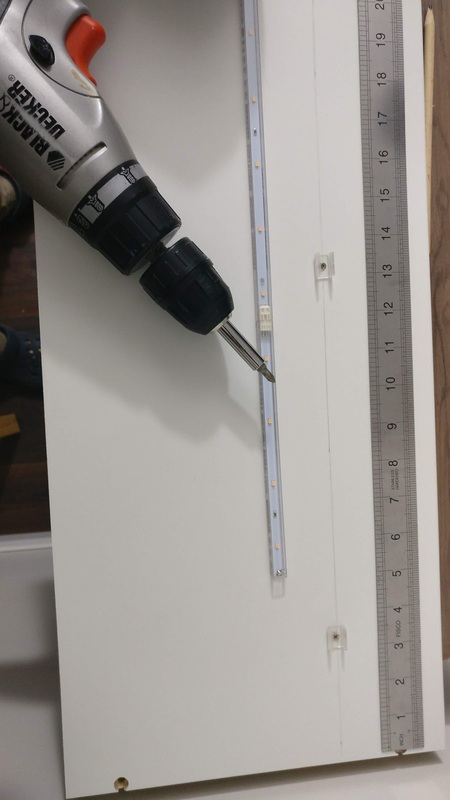 Position your best pieces directly under the lighting strip, and you're done! I'm going to add dust proofing to this using 3mm insulation tape on the top and bottom of the doors. But that's a project for another day. I wouldn't have the space or confidence to use normal bulbs. Some of those models are resin, and I think they'd probably melt away after a couple of days. The usual trio I run up against is Time, Money, Energy, but yeah, Space is often a concern as well. And for projects like these, two out of three (or three out of four) just ain't good enough. Great that you finally got around to it. The final result looks fantastic. Hopefully I'll be able to get something similar together at some point. Duardin, wood and cavalry orders. 2018.- A Hobby Year in reflection. Celestial Vindicators Tutorial is live! Copyright © 2017 Nerodine. Simple theme. Powered by Blogger.